Survey: In OUCC Proc 5 ». 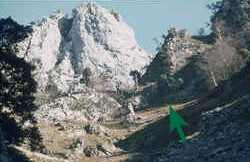 Directions: Walk to the cave starts at northern end of Coto del (de El) Infierno, which is reached over a narrow bridge Δ that crosses the Deva. The cave is around the ridge to the south, up a very steep ‘path’; in 2001 it took 90 minutes up to the cave; 45 minutes down. Description: Impressive cave with huge chambers, etc. ; over 2km long. Probably first explored by S.E.S. TALPS in 1969 ‘in the company of Sr. Caracol’. From OUCC Proc 5 » (MFC): “‘A further visit would almost certainly yield new passages’ (3) – how often is this kind of statement met in expedition reports. However the writer had promised himself the trip, and so two years and two expeditions to the Picos later, a return visit was made to the La Hermida gorge in the company of Martin Laverty, Steve Newton and Bill Collis. After meeting a Spanish team from Barcelona, who were planning to resurvey the cave over the next few days, we sweated up the hillside and eventually found the entrance. 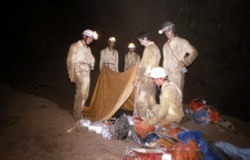 A fairly direct route through the cave soon brought us to the previous limit of exploration. * An easy but cold duck was soon passed – this led to the beginning of a deep, wide lake winding off into the darkness. Not being equipped for swimming a retreat was made back out and down to the Spanish camp at Coto del Infierno. On discussing this find with the Spanish cavers it transpired that one of their members had stumbled on the lake while lost some three years before – but had been unable to find it again. *S.E.S. TALPS had explored and surveyed the cave up to this point about five years ago. This is 1km beyond the point described as the ‘limit of exploration’ in: SES Talps del Centro Excursionista de Valles, 1971, “Cavidades de la Zona de La Hermida (Santander)”, Cuadernos de Espeleologia 5-6, pp pp 231- 250. 1973 – 6 trips by/with BUSS; see OmniBUSS 5 » pp10–12. Expeditions to the Picos de Europa and elsewhere since 1973.
if you have any corrections, suggestions, etc. 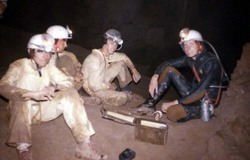 See also the SpeleoTrove speleology section ». This page was last edited on 2008-12-08 by mfc.